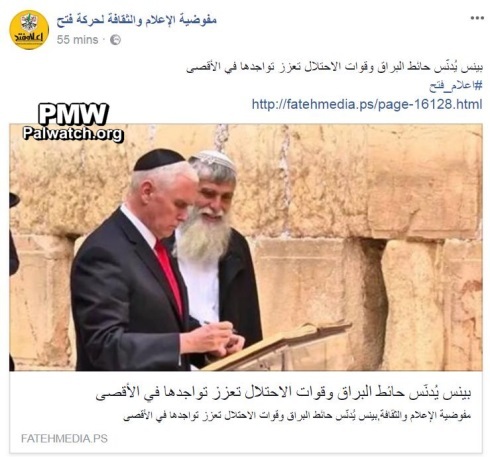 Fatah: "Pence defiles the Al-Buraq Wall"
"Pence defiles the Al-Buraq Wall"
Fatah secretary: The US "is an enemy of the Palestinian people"
Fatah official: Pence's visit to "the Al-Buraq Wall" - the Western Wall - "is an attack against the Palestinian people"
Fatah official: "The activities of rage will continue"
PLO Chief Negotiator Erekat: Pence's speech was "a crusade" and "an attack" that "proved the US administration is part of the problem and not part of the solution"
PA Mufti: "The Al-Buraq Wall is an inseparable part of the blessed Al-Aqsa Mosque, and it is an Islamic site"
"Pence defiles the Al-Buraq [Wall] plaza, and the occupation forces reinforce their presence at the Al-Aqsa Mosque." "The Al-Buraq Wall" is the name used by Palestinians for the Western Wall of the Jewish Temple because the wall is said to be where Islam's Prophet Muhammad tied his miraculous flying steed named Al-Buraq during his Night Journey. 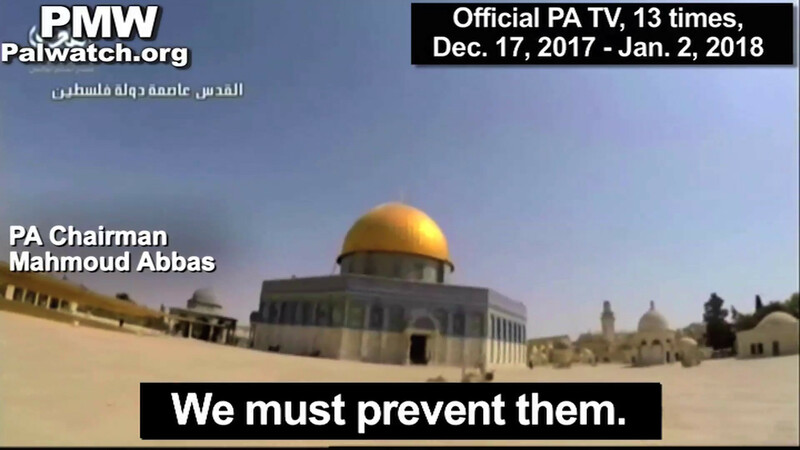 Palestinian Media Watch has exposed numerous statements by Palestinian leaders denying the Jewish historical ties to Jerusalem and the existence of a Jewish Temple at the site. PA Chairman Mahmoud Abbas: "We have to prevent them, in any way whatsoever, from entering the Sanctuary. This is our Sanctuary, our Al-Aqsa and our Church [of the Holy Sepulchre]. They have no right to enter it. They have no right to defile it. We must prevent them. Let us stand before them with chests bared to protect our holy places." A picture from the vigil shows participants waving Palestinian flags and holding a poster showing pictures of US President Donald Trump and Pence with red "X"s over them, and pictures of the Church of the Holy Sepulchre, the Dome of the Rock, and the Al-Aqsa Mosque. The poster carries the PLO logo that features a flame, the Palestinian flag, and the PA map of "Palestine" that presents all of Israel as "Palestine" together with the PA areas. Text on poster in English: "Jerusalem is the heart, Soul, and Capital of Palestine." 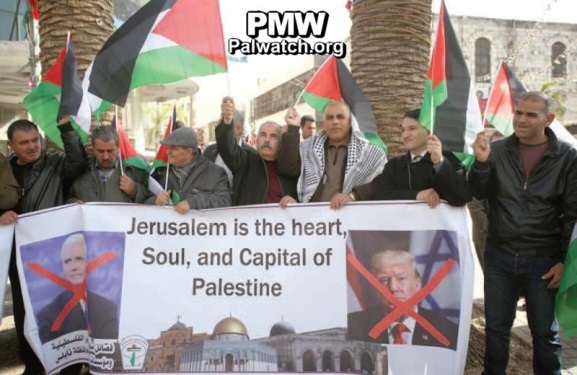 When Pence was scheduled to visit Israel in December 2017, PMW reported that Palestinians burned posters of Pence, and that PA officials repeated their denial of Jewish ties to the Western Wall. "Pence's visit to the Al-Buraq Wall is an attack against the Palestinian people, as he is visiting East Jerusalem - the capital of the State of Palestine - at a time when the Palestinian leadership and people are not welcoming him." the activities of rage against US President Donald Trump's decision on Jerusalem [declaring it Israel's capital], and against the unwanted visit of his Vice President Mike Pence will continue in all of the districts... Muhaisen emphasized that 'the various national activities and their continuation are part of the Palestinian struggle to end the occupation, because in his latest declaration Trump put an end to America's role as any sort of a mediator in the political process.'" PMW has documented several calls for "rage" and violence by Fatah and the PA since Trump's recognition of Jerusalem as Israel's capital. "[Erekat] criticized the speech that US Vice President Mike Pence gave before the Israeli Parliament. He described it as 'a crusade' that constitutes 'a gift to the extremists.' Erekat said that the attack that Pence led in the Israeli Parliament... proved that the American administration is part of the problem and not part of the solution. He added that Pence's message is clear: Violate the law and international decisions, and the US will reward you." [the US] is striving to realize the plans of this evil alliance... With the same arrogance and baring teeth, Pence declares that peace is more possible now after Trump's decision on Jerusalem! On this matter we say to Pence what the people of our country say: 'A crazy person speaks and an intelligent person listens.' What peace is possible, Vice President Pence, without Jerusalem being the capital of the State of Palestine?" "Anything can be expected from those who have committed the historical crime and from the leaders of the new US in the age of the Hitleresque and Balfouresque Trump, who think that the Earth is a cake that they have the right to divide and give pieces of to whomever they want however they want." "We are standing today in the plazas of the blessed Al-Aqsa Mosque, at the same time as US Vice President Mike Pence's visit to the Al-Buraq Wall, in order to emphasize that the Al-Buraq Wall is an inseparable part of the blessed Al-Aqsa Mosque, and that it is an Islamic site." Headline: "Protest vigil in Nablus against Pence's visit to the region"
"Dozens of Nablus residents yesterday [Jan. 22, 2018] participated in a protest vigil against US Vice President Mike Pence's visit to the occupation state and the region. [the US] is an enemy of the Palestinian people and its aspirations for freedom and independence." National unity, national mobilization Liberation." Text on poster in English: "Jerusalem is the heart, Soul, and Capital of Palestine"
"Fatah Movement Central Committee member, [Fatah Commissioner of Mobilization and Organization in the West Bank, and PLO Central Council member] Jamal Muhaisen said in a phone call with [the official PA news agency] WAFA that Pence's visit to the Al-Buraq Wall (i.e., the Western Wall of the Temple Mount) is an attack against the Palestinian people, as he is visiting East Jerusalem - the capital of the State of Palestine - at a time when the Palestinian leadership and people are not welcoming him. [Muhaisen added that] the British committee determined in 1929 that the wall belongs to the Muslims and that the Jews have no connection to it or place there (sic., the 1930 Wailing Wall Commission did not rule out the Jewish connection to the Western Wall; see note below -Ed.)." The 1930 Wailing Wall Commission was appointed by the British government, with the approval of the League of Nations, to settle the matter of the Jews' and Muslims' rights and claims to the Western Wall. The commission concluded that the Western Wall had served as a Jewish holy site long before it became a Muslim waqf (an inalienable religious endowment in Islamic law). The commission's final conclusion was that although the Western Wall was a Muslim waqf, it was holy to both Muslims and Jews and therefore the Jews should be granted free access to worship at the site. The US is today forming the alliance of baring teeth and arrogance against the Palestinian people with Israel and the racist and extremist right-wing. Through this exclusionary democracy... [the US] is striving to realize the plans of this evil alliance... With the same arrogance and baring teeth, Pence declares that peace is more possible now after Trump's decision on Jerusalem! On this matter we say to Pence what the people of our country say: 'A crazy person speaks and an intelligent person listens.' What peace is possible, Vice President Pence, without Jerusalem being the capital of the State of Palestine? The racism of the occupation and its ally the US will not be a decree of fate under any circumstances... We are standing firm on our land and resisting until the defeat of the occupation and all of its aggressive plans, in order to establish the free and independent State of Palestine whose capital is East Jerusalem, with a fair solution to the problem of the refugees." Headline: "Muhaisen: The activities of rage will continue"
Muhaisen emphasized that 'the various national activities and their continuation are part of the Palestinian struggle to end the occupation, because in his latest declaration Trump put an end to America's role as any sort of a mediator in the political process.'" Headline: "The Arab members of the Israeli Parliament - the frontline of Jerusalem"
Anything can be expected from those who have committed the historical crime and from the leaders of the new US in the age of the Hitleresque and Balfouresque Trump, who think that the Earth is a cake that they have the right to divide and give pieces of to whomever they want however they want. Those who inherited the colonialist mentality in the American continent and are silent about the crime of the destruction of the Indians will certainly agree with the inheritors of the project expelling the Palestinian people from its land." During US Vice President Mike Pence's speech before the Israeli Parliament on Jan. 22, 2018, the Arab members of the Israeli Parliament disrupted his speech by waving posters showing a picture of the Church of the Holy Sepulchre and the Dome of the Rock with the following text in English and Arabic: "Jerusalem is The Capital of Palestine." They were quickly removed from the plenum. Headline: "The US vice president was witness to the expulsion of the Arab members of the Israeli Parliament from the Israeli Parliament, and bragged that the [US] embassy will be transferred to Jerusalem by the end of 2019 - Erekat: Pence's racist attack at the Israeli Parliament is a gift to the extremists, the US is part of the problem"
"Secretary of the PLO Executive Committee, [Fatah Central Committee member, and PLO Chief Negotiator] Saeb Erekat yesterday [Jan. 22, 2018] criticized the speech that US Vice President Mike Pence gave before the Israeli Parliament. He described it as 'a crusade' that constitutes 'a gift to the extremists.' Erekat said that the attack that Pence led in the Israeli Parliament... proved that the American administration is part of the problem and not part of the solution. He added that Pence's message is clear: Violate the law and international decisions, and the US will reward you." Headline: "Pence defiles the Al-Buraq Wall, and the occupation forces strengthen their presence in the Al-Aqsa Mosque"
"US Vice President Mike Pence today, Tuesday [Jan. 23, 2018], defiled the Al-Buraq Wall (the western wall of the Al-Aqsa Mosque) [parentheses in source], and conducted Talmudic (i.e., Jewish) prayers and rituals (sic., Pence prayed privately) together with several leaders of the Israeli occupation state and the extremist right-wing parties (sic., no Israeli government officials accompanied Pence's visit to the Western Wall)." Headline: "A strike throughout Jerusalem and Palestinian flags wave above the Al-Aqsa Mosque during Pence's visit"
Al-Hayat Al-Jadida that Jerusalem, with its history and culture... will not change due to American steps. The mufti added: 'We are standing today in the plazas of the blessed Al-Aqsa Mosque, at the same time as US Vice President Mike Pence's visit to the Al-Buraq Wall (i.e., the Western Wall of the Temple Mount), in order to emphasize that the Al-Buraq Wall is an inseparable part of the blessed Al-Aqsa Mosque, and that it is an Islamic site.'"